Dog Blog Post #407: Editor's Note: Yup, that was Zachary obsessing about the Lacrosse Ball in yesterday's shot, and yup, that was Zachary in the B&W shot. For the promised reprise of it, check out the bottom of the blog. The Daily Shoot for today? Make a photograph that illustrates a memory from your childhood. Ugh. Had a hard time with this one. I didn't even have a dog as a child! Hubby suggested switching it to a memory from the dog's puppyhood, and if this assignment pops up again I just might do that. 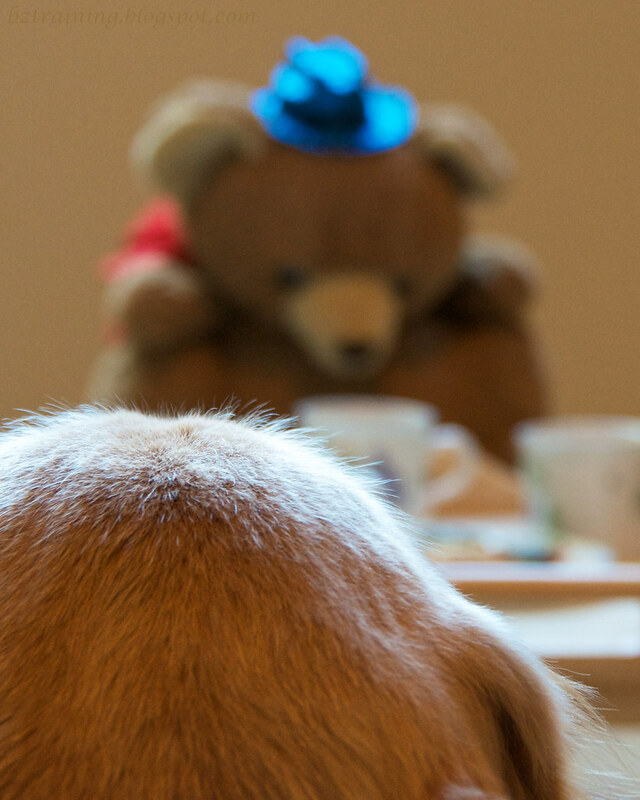 Sometime around mid-morning, after spending enough time walking around chanting, "memory, memory, memory," the thought of a Teddy Bear Tea Party popped into my head. Had the season been anything other than summer I might have set up the set, but it isn't, so I swallowed my photographic pride, raised my ISO, put the camera on the tripod to get the exposure time as long as I dared, and hoped the dimness of the light and the "graininess" of the shot would be considered "atmospheric". BTW: It seems I have been misusing the term "shutter speed". Shutters always move at exactly the same speed, no matter what you dial into your camera. What varies is how long between the front shutter slamming open and the back shutter slamming closed, controlling how long the sensor is exposed to light. So, what I should be saying is "exposure time", and will endeavor to remember to do so in the future. Where was I? Ah yes, childhood memories. Pictured above is Bear. 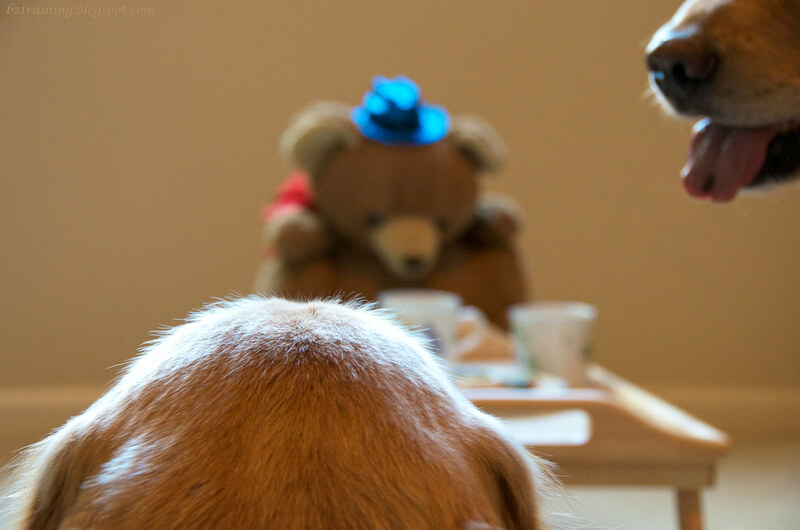 Like many young girls, I had my share of tea parties, and Bear (yes, THAT bear) was at some of the later ones. My favorite shot of this bunch is the one above. It's a crop of the shot above it (which itself was taken as just a test shot as I was finding the right spot for the tripod) but after uploading the first shot to flickr I realize I should have cropped it. That said, while I like the cropped shot as I think it might be more "artistic" (perhaps? ), I think the wider shot (the one I posted) matches the assignment better. Henry is obviously becoming quite comfortable in hats. 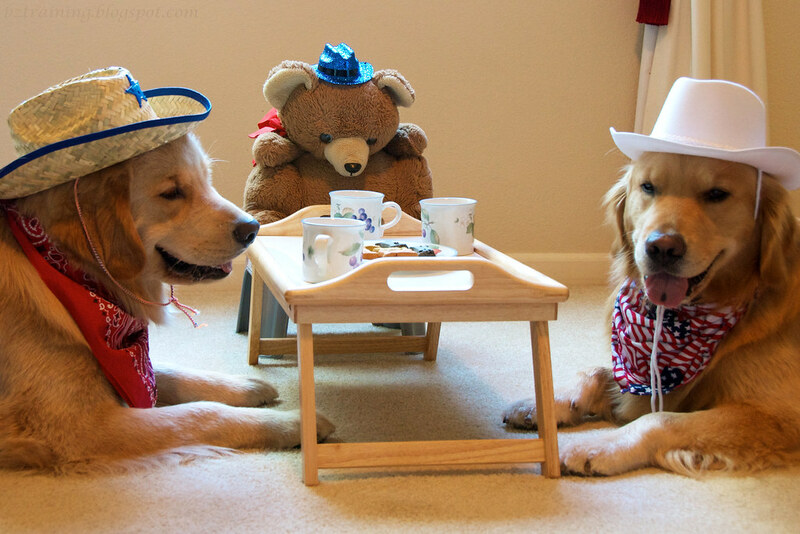 I set dogs in their spots, put hats on their heads, set the cookies on the tray, took a dozen or so shots, and nobody even moved. When I was done, I split the cookies on the plate between them (3 each) and called it day. #4) "What are you preserving? Jams and jellies? Newspaper articles? Nature? Show us." 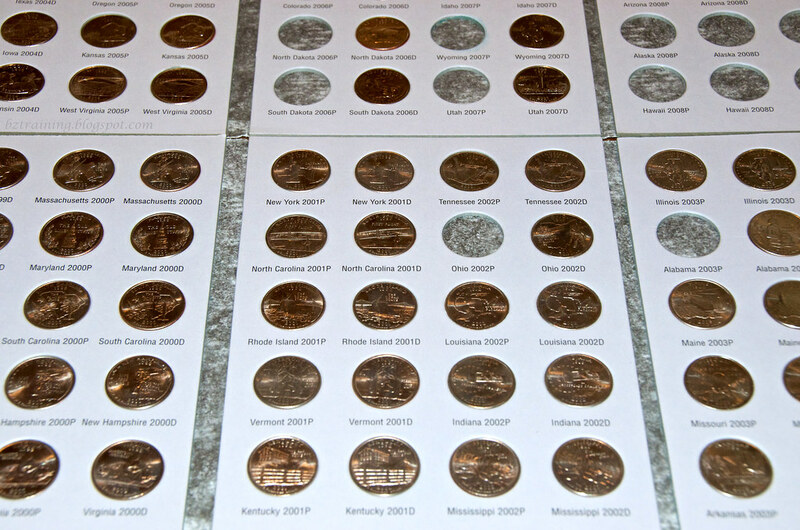 US State Quarters... finding those "P" Quarters on the Left Coast is hard! #22) "Pitch" can refer to music, a carny spiel, throwing, a cricket field, tree sap, etc. Pitch in! 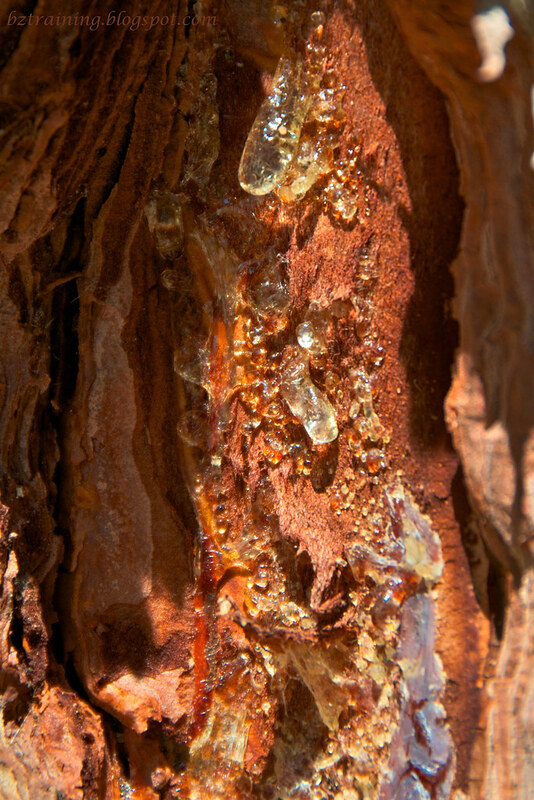 Tree Sap - Don't look at me, I didn't dream up the topic! I absolutely loved your memory shots! It's such a great mix of nostalgia and the boys' expressions are perfect. I think this is one of your better shots, but that's just my humble opinion. I am stumped on the "preserving" part of the challenge. I'd best get myself in gear on that here soon! The weekend seems to have escaped me completely. I can see more what you were going for in the last photo now, and I think it turned out really well! Love all the little details of his fur! I told you you'd jinx us on the DS! Orange on Monday! Gah! As always my Human is facinated by your shots, especially the first and last. Here here! It tooks us a long time to find all those Quaters when we lived in DC. As always, I love the pictures! OMD. Precious. Just precious.I just love that top shot! The curves shot is very moody now. Great idea - I love the tea party photos.